Description: Trio of Santa Fe GP40-X's lead westbound tonnage at Chester. Description: ATSF GP 40X'S 3804 3805 Rounding curve, heading to Summit. 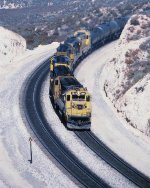 Description: ATSF 3804 West waits at Dalies for a couple of eastbound and clearance to enter the Gallup Sub main. This was the Grants local.